Hundreds of applicants apply to one job post. In fact, our partners experience 20- 50 applications per job post per day. This is a daunting task for anyone, since it requires reading dozens of resumes without an objective basis on their qualifications. T o ease this process, recruiters nowadays depend on recruitment applications such as an Applicant Tracking System (ATS). 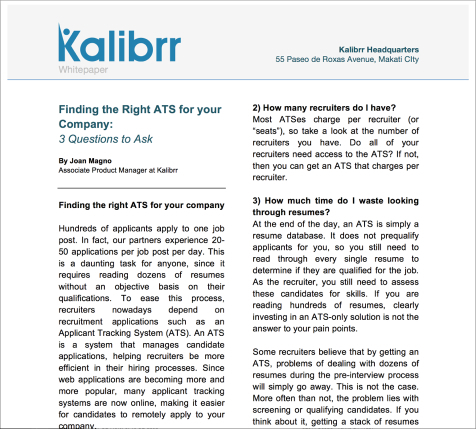 An ATS is a system that manages candidate applications, helping recruiters be more efficient in their hiring processes. Since web applications are becoming more and more popular, many applicant tracking systems are now online, making it easier for candidates to remotely apply to your company. Complete the form so we can send you a copy. I would like to receive information about how I can hire better.